The interface for wireless simulator for VBar Control is now available. The set contains all needed connection wires. It includes a full receiver satellite, that may be used for other purposes as well. The Interface works with the usual PPM inputs of all simulators that support free channel mapping. The first major update for VBar Control is available! We pick up many if not most of your requests and wishes, and at the same time extend the range of features. Thanks to our automated online update feature, getting the new stuff is extremely straightforward: download the new VBar Control Manager, connect your VBar Control to the computer, and watch it installing and updating. Please follow these Instructions! Currently its already possible to manage your batteries with the battery log function of VBar Control. 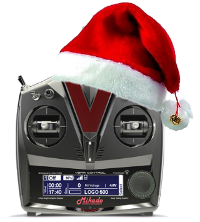 Now there is a new stage available, to let the radio do everything for you automatically, and without any additional steps in the normal flying routine. Congratulation to Ofek, and Korawich Thongsri (4th) to the great sucess! Ofek uses a Logo 700 XXtreme with a Silverline VBar 6.0 with VBar Control. Again this combination has prooven its superior performance and reliability in a World Class Competition. 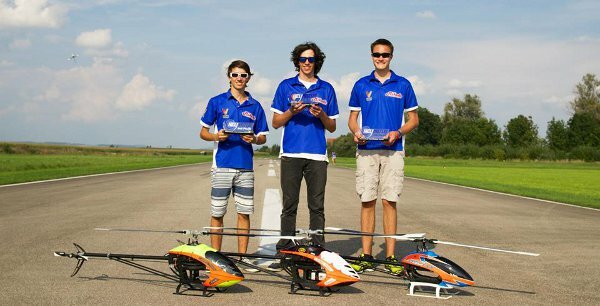 Not only the Mikado team pilots, but lots other participants of the Helimasters where successful with VBar and VBar Control. Id like to send my congratulations to the first three Pilots of the competition. Marius Müller won the title, which he really deserved. He worked very hard and made big progress in his flight routine. All this now has payed off, well done Marius! 5 August, 2014 - 07:50 — Eddi E. aus G.
Mikado Model Helicopters will attend this year's IRCHA Jamboree with an own booth. As a speciality, Mikado USA will be there too, next to Mikado's own booth. This gives you the opportunity to not only check out and test our new products at the Mikado tent and ask all the questions you have on your mind, but also to buy on site. You can try out VBar Control hands-on, of course. Please do not hesitate to ask us any questions you have.